Strong Q3 earnings season nearly in the books.With 90% of S&P 500 Index companies having reported, S&P 500 Index earnings growth is tracking to an impressive 27.9% year-over-year increase, the highest growth rate since the fourth quarter of 2010 and 6 percentage points above expectations as of quarter end. Beat rates of 77% and 60% for earnings and revenue are impressive, as is the amount of earnings upside. However, we are most impressed with the amount of revenue upside-tougher to generate-that has been generated over the past two weeks. Revenue growth is tracking to an 8.5% year-over-year increase, compared to 7.7% just two weeks ago. The strong top line performance, clearly boosted by a strong U.S. economy, is particularly impressive given there is no direct benefit from the lower corporate tax rate. The resilience of earnings estimates, despite tariffs, has also been impressive. S&P earnings estimates for the next 12 months have only been reduced by 0.8% since quarter end, less than the 5-year average decline during earnings season of 1.6% and the 10-year average decline of 2.1% (source: FactSet). Trade check-in. The U.S.-China trade dispute has carried on for about eight months, with no agreement in sight. So far, the global economy has avoided a trade breakdown, as exports and imports are growing steadily for both the U.S. and China. 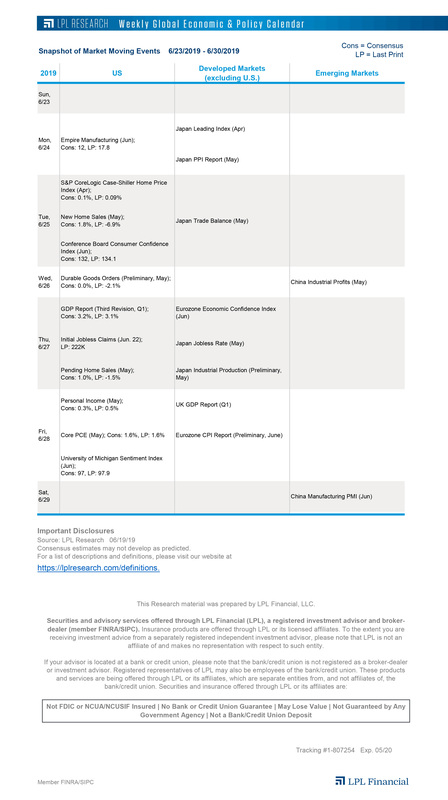 In this week’s Weekly Economic Commentary, due out later today on lpl.com, we examine the current state of trade, and highlight small cracks we’ve observed in the global economy, which have formed indirectly from trade tensions. Midterm takeaways. In last week’s midterm election, Republicans held onto the Senate and the Democrats claimed control of the House, bringing potential gridlock to Congress. In this week’s Weekly Market Commentary, due out later today on lpl.com, we discuss investment implications of the midterms, including positive seasonal tailwinds now in place for stocks. We also highlight potential winners and losers at the sector level, and risks that the leadership change in Washington may present. For a summary of our thoughts, check out our LPL Research blog, which will be published later today.